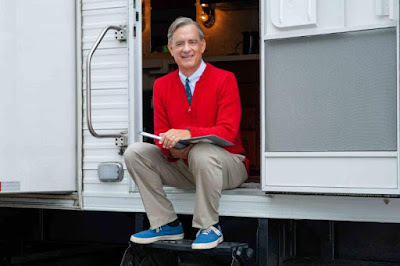 Here's the first photo of Tom Hanks as Mr. Rogers on set of the untitled Mr. Rogers / Tom Hanks Project which is coming in October 2019. Two-time Oscar®-winner Tom Hanks portrays Mister Rogers in Untitled Mr. Rogers/ Tom Hanks Project, a timely story of kindness triumphing over cynicism, based on the true story of a real-life friendship between Fred Rogers and journalist Tom Junod. After a jaded magazine writer (Emmy winner Matthew Rhys) is assigned a profile of Fred Rogers, he overcomes his skepticism, learning about empathy, kindness, and decency from America's most beloved neighbor.